Chapter II. The name and titles of the Holy Spirit. Chapter III. Divine nature and personality of the Holy Spirit proved and vindicated. Chapter IV. Particular works of the Holy Spirit in the first or old creation. Chapter V. Way and manner of the divine dispensation of the Holy Spirit. Chapter I. 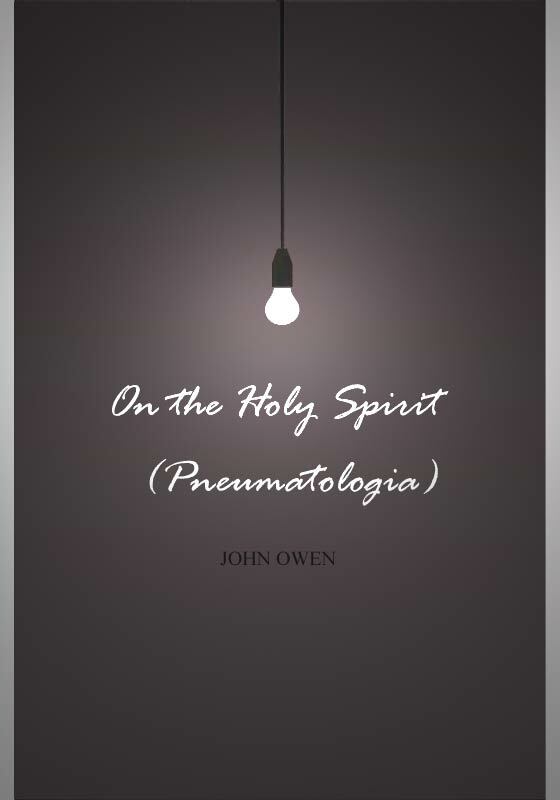 Particular operations of the Holy Spirit under the Old Testament preparatory for the New. I. Extraordinary Works of the Spirit. II. Ordinary Works of the Spirit. 1. In respect to political things. 2. In respect to moral virtues. 3. In respect to natural abilities. 4. In respect to the intellect. Chapter II. General dispensation of the Holy Spirit with respect to the new creation. Chapter III. Work of the Holy Spirit with respect to the head of the new creation - the human nature of Christ. Chapter IV. Work of the Holy Spirit in and on the human nature of Christ. Chapter V. The general work of the Holy Spirit in the new creation with respect to the members of that body of which Christ is the head. Chapter II. Works of the Holy Spirit preparatory to regeneration. Chapter III. Corruption or depravation of the mind by sin. Chapter V. The nature, causes, and means of regeneration. Chapter VI. The manner of conversion explained in the instance of Augustine. Chapter I. The nature of sanctification and gospel holiness explained. Chapter II. Sanctification is a progressive work. Chapter III. Believers are the only object of sanctification, and subject of gospel holiness. Chapter IV. The defilement of sin, what it consists in, with its purification. Chapter V. The filth of sin is purged by the Spirit, and the blood of Christ. Chapter VI. The positive work of the Spirit in the sanctification of believers. Chapter VII. Of the acts and duties of holiness. Chapter VIII. Mortification of sin, the nature and causes of it. Chapter I. Necessity of holiness from the consideration of the nature of God. Chapter II. Eternal election is a cause of and motive for holiness. Chapter III. Holiness is necessary from the commands of God. Chapter IV. Necessity of holiness from God's sending Jesus Christ. Chapter V. Necessity of holiness from our condition in this world. Chapter III. Various convincing external arguments for divine revelation. Chapter IV. Moral certainty, as the result of external arguments, is insufficient. Chapter V. Divine revelation itself is the only foundation and reason of faith. Chapter VII. Inferences from the whole — Some objections answered. Appendix to Book VI — Part I. Book VI. Part II. UNDERSTANDING THE MIND OF GOD. Chapter III. Other testimonies pleaded in confirmation of the same truth. Chapter IX. Ecclesiastical Helps in the interpretation of the Scripture. Chapter I. The use of prayer, and the work of the Holy Spirit in it. Chapter II. Zec 12.10 explained and vindicated. Chapter III. Gal 4.6 explained and vindicated. Chapter IV. The nature of prayer — Rom 8.26 explained and vindicated. Chapter V. The work of the Holy Spirit as to the matter of prayer. Chapter VI. What the due manner of prayer consists in. Chapter VIII. The duty of external prayer by virtue of a spiritual gift, explained and vindicated. Chapter IX. Duties inferred from the preceding discourse. Chapter X. Of mental prayer as pretended to by some in the Church of Rome. Analysis of the first treatise. Analysis of the second treatise. A DISCOURSE — OF THE HOLY SPIRIT AS A COMFORTER. Chapter II. General properties of the office of a comforter. Chapter IV. Inhabitation of the Spirit is the first thing promised. Chapter VI. The Spirit is a seal, and how. Chapter VII. The Spirit is an earnest, and how. The Application of the Foregoing Discourse. A DISCOURSE — OF SPIRITUAL GIFTS. Chapter I. Spiritual gifts, their names and meaning. Chapter II. Differences between spiritual gifts and saving grace. Chapter III. Of extraordinary gifts and offices; first, of offices. Chapter IV. Extraordinary spiritual gifts, 1Cor 12.4-11. Chapter V. The origin, duration, use, and end, of extraordinary spiritual gifts. Chapter VIII. Of the gifts of the Spirit with respect to doctrine, worship, and rule.